I have classic ASP running on IIS 7. Even though I configured the ASP "Debugging Properties" to "Send Errors to Browser = True", the web app REFUSES to send errors to the browser and continues to send a 500 internal server error. My browser has "Show Friendly HTTP Error Messages" unchecked. 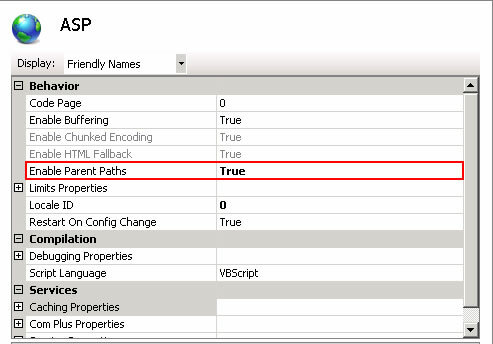 IIS Manager >> double click the ASP icon to open the ASP page. Expand the Debugging Properties node and set Send Errors To Browser to True. If you are hosting the project in a shared environment then you can use the following snippet to view the errors. If your website is configured to connect to the physical path of the website as a specific user, instaed of using pass-through authentication, you may get this error if there is a permissions error with this user. It may also be necessary to restart the Windows Process Activation Service and then restart IIS. Not the answer you're looking for? Browse other questions tagged iis-7 asp-classic iis-7.5 or ask your own question. How to debug http 500 while a web service is called?